With the drama and power of a gripping novel, Ken Cooper's memoir tells the story of his life of crime and his redemption in the midst of a horrific prison. In a vivid, you-are-there style, this former gentleman bank robber takes readers on a journey through years of armed robberies, the dramatic shooting that ended his career, and the horrors of prison, to a soul ultimately finding peace. Without fear or embellishment, Cooper openly shares the darkest moments in his life. Yet in these moments he finally meets God, becoming a bright light in one of Florida's most notorious prisons. From adrenaline-pumping true-life crime to an experience of God's gentle love, readers won't be able to put down this gripping memoir of transformation and God's grace. This was quite a heavy read. It was not at all what I expected, but very fascinated. I could have done without the few curse words that were included. But, the story of how a man went from seeming to have it all, to falling far into sin, then back out was quite interesting. 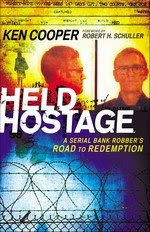 Held Hostage: A Serial Bank Robber's Road to Redemption is definitely worth your time.